All in all, it’s a picture of compelling and significant differences between the Kenyan and white athletes, and points towards greater elasticity in the Kenyan calves. The significance for running, of course, is that if the tendons are more elastic, the running economy is improved significantly, and this means faster running at lower oxygen cost. At least, this is the theory. What the study is NOT, however, is any kind of proof of what makes Kenyan runners so good compared to European/Caucasian runners. And herein lies the catch. When performing a comparison between two groups like this, it’s very important to know what you have to match. And if you don’t match the groups correctly, then the conclusions you reach will be entirely misdirected, and this is what I would suggest is happening in this research study. the Kenyan MG muscle–tendon unit is optimized to favor efficient storage and recoil of elastic energy. The real problem with this study, at least in terms of its definitive application to the question of Kenyan running ability, is that it makes an unfair comparison. If you take what are clearly crucial factors for performance in highly performing athletes, and compare them to the same factors in untrained people, you are destined to find a difference that has nothing to do with ethnicity or race, and everything to do with performance. You are not so much measuring the advantage of Kenyans, as you are the advantage possessed by people who train and are athletic, and you could read the entire research paper, inserting the word “elite” every time you see “Kenyan” and it would make just as much sense. So a lot depends on what your question is. If you ask “What makes the Kenyans so good?” and you answer “They have elastic calf muscles”, then you’d be making the mistake of over-applying the finding of this research. If however you ask “What physiological characteristics may set elite athletes apart from sedentary folk?”, then you can point to this study as providing evidence of another factor that ALL distance runners, not just Kenyans, need to possess. What you don’t know, of course, is whether the athlete becomes elite because of highly elastic tendon, or whether the tendon elasticity improves with training – that’s an answer for a longitudinal study. So, I don’t mean to be too critical of the research, I think it’s sound and provides very interesting data. Perhaps most crucially, it identifies yet another physiological attribute of elite athletes – high tendon elasticity. But you cannot extrapolate this study into the debate about Kenyan running dominance. All it does, for now, is provide evidence that Kenyan athletes possess musculo-tendinous qualities that are likely beneficial for distance running, but it has not yet shown that these characteristics do not exist the world over. It is thus incomplete, not incorrect, and requires that elite white runners and sedentary Kenyans be included in the results, which would complete the picture and allow a broader conclusion. The true control group, to whom the elite Kenyans should be compared, however, is a group of performance matched athletes from Europe, or America, or perhaps even Ethiopia/Uganda/Eritrea. I strongly suspect that if Galen Rupp, or Chris Solinsky, or even the Brownlee brothers, or any one of the fifty world class white middle- and long-distance runners, were included in the control group, the differences would disappear. This should, I hope, be relatively obvious. On that note, if you did test all these groups of performance-matched runners, and you still find differences, then you’ve found something really fascinating, because you’ll have shown that the same performance can be the result of many different “input” characteristics, and there’s not one thing that predicts performance. This is arguably true, and it’s why so many studies trying to find differences in things like VO2max or running economy fail – performance is multi-factorial. So, if this study can’t conclusively answer the Kenyan performance question, what is the study that is required? Let me start off by saying that in 2013, I’m going to get a taste of this very challenge, because as I write this, a friend and colleague, Dr Jordan Santos Concejero, is about to board an aeroplane from Spain to conduct post-doc research with me in Cape Town, and we are going to be investigating a number of biomechanical, neurological and physiological factors in elite Kenyan runners. I’ll tell you those details at some stage in the future, but I will say that in the planning stages, our biggest question, by far, has been figuring out who to compare the Kenyans to. We have some decent, but not great runners in South Africa – 29 to 30 min for 10km, and so if we compare Kenyans to these guys, we’ll end up finding differences, NOT because they’re Kenyan, but because they are 1 to 2 min faster than our control group! Of course their VO2, lactate, economy, fatigue profile, EMG and mechanics are different – they’re at a different level of running ability. So, we now face the Catch-22 of doing Kenyan research. I have no answer for you yet, but it is a real problem as we grapple with the questions of Kenyan dominance. The reality is that there are not enough non East African runners in the world who can run 27-min for 10km to answer this question. Galen Rupp and Solinsky are really the only two, perhaps Mottram in his prime was at that level, but the cupboard is bare. I’ll let you know what we end up deciding for our research! What can be done? One option is to compare completely untrained individuals from Kenya to those from Europe. In this way, you eliminate the training confounder, and your hypothesis may be that Kenyans have greater elasticity even without training. Another is to investigate children, for the same reason. Saltin did this many years ago, but that study struggled because even at that age, there are such vast differences in lifestyle that Kenyan and Danish (in that case) are quite different. Even here, however, you’re not really answering the question, because you’re still looking for a unique attribute thing, or even a group of attributes that can explain why an individual from one group can achieve more than an individual from another group. I’d call this is the “unique factor approach”, and it’s probably doomed to failure, it’s highly unlikely that the Kenyans have something unique, that the rest of the world does not possess. This is also the reason nobody has found THE gene for performance – there’s not one thing. And it certainly won’t be present in just one tiny group of people, even if it did exist. This is a futile approach, one that is often taken, and whose failure is often used to justify the idea that genes don’t matter. Nothing could be further from the truth. All it means is that there is no gene, or other factor (like calf elasticity) that is unique to Kenyans or Ethiopians. Or Jamaican sprinters, for that matter. It doesn’t mean that genes aren’t crucial, as some have suggested. Rather, what you have to look at is whether that unique factor, or collection of factors, is present with a greater frequency in one group than other. That’s the key. And that leads me to my theory for Kenyan and east African dominance, and bear with me as I play the hypotheticals. Let’s say that there are ten characteristics that make elite runners who they are. Economy, maximal oxygen uptake, biochemistry are there, and now add calf elasticity, Achilles tendon length and muscle power to the list. These characteristics sum together to equal the great distance men who can run sub-27 min for 10km and 2:05 marathons. To be in this elite group, you have to possess those characteristics. The value of the latest study on calf elasticity is not that it differentiates Kenyans from other populations, but rather that it points us towards more of the factors that are non-negotiable for elite runners. Now, all over the world, you’ll have individuals who possess these characteristics – they tick the boxes. There’s nothing in the Kenyan population that is unique. No muscle fiber, no skinny calf, no elastic tendon, no enzyme, no brain, no heart. They do not have ‘exclusive rights’ to some magical 11th factor that makes them better runners than the rest of the world. But, what they might have, and this is my current thinking, is a higher prevalence of people with the “right stuff”. Out of a group of 100 untrained east African “aspirants”, I’d hypothesize that more will have the right collection of running-positive attributes than a similarly trained group of 100 anywhere else. If that group trains and is exposed to the right culture to excel in a sport, then the result is that so many emerge from the population with the ultimate outcome – performance ability. We know that Kenya, Ethiopia and Eritrea have the right macro- and micro-environment, allied to a culture and history of running, that creates the perfect “melting pot” for endurance running. If it is the case that the “right” genes, and hence physiological characteristics like muscle-tendon elasticity are more prevalent, then the dominance they have becomes clearer to understand. That’s my hypothesis – a higher density or prevalence of running-beneficial characteristics, to which training and lifestyle are applied in greater numbers than anywhere else. Now all that is required is the proof! 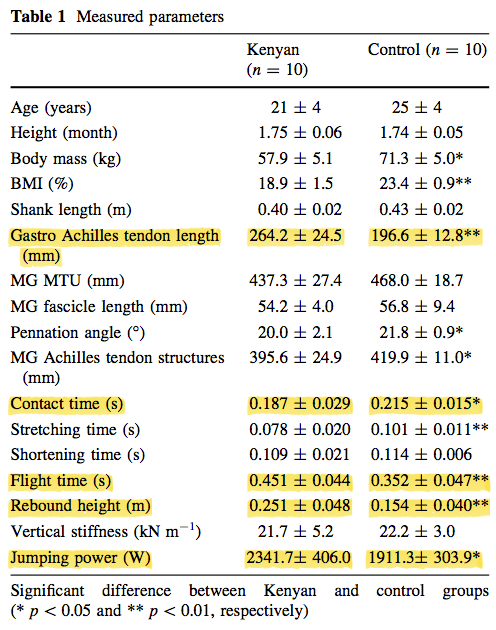 The latest study is intriguing because it finds that calf elasticity and Achilles tendon length are different in Kenyan athletes compared to sedentary whites. This is not however a finding that should be used to argue that Kenyans dominate running because they have more elastic calves than whites. This is very unlikely to be a unique advantage, and there are doubtless individuals the world over who have the same attribute. What the study does do is provide further evidence that tendon elasticity is a crucial factor in determining performance. With respects to the Kenyan question, the next step is to ask whether the prevalence of this characteristic is greater in the Kalenjin population, because that may start to uncover why they are able to produce so many world class athletes, not neglecting the fact that the culture and training environment that has been created in Kenyan “unearths” so many of these exceptional runners. As always, comments and discussion welcome.